As we move towards the end of Breast Cancer Awareness month, it is important to celebrate the many success of breast cancer research and treatment – whilst breast cancer may be common, more women than ever before are surviving thanks to earlier diagnosis and an improved understanding of the biology of breast cancer leading to more personalised medicine. That said, we still face major challenges. The one that is on the forefront of my mind is the “margins problem” once called the ‘hidden epidemic of breast cancer’. 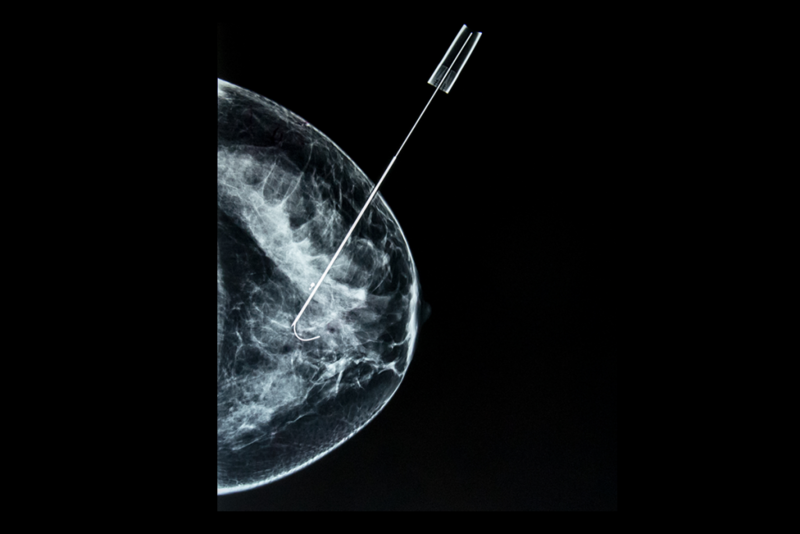 Patients with breast cancer often prefer having breast conserving surgery (lumpectomy or wide local excision) rather than mastectomy as there are benefits to keeping as much breast tissue as possible in terms of quality of life. The problem with breast conserving surgery is that in an effort to remove only the cancerous tissue and preserve as much healthy breast as possible surgeons often unwittingly cut too close to the edge of the cancer. The edge of the cut surface is called the “margin”, and cutting too close to the edge risks a positive margin which describes tumour cells too close to that edge. Its a huge challenge for patients and surgeons. Cutting a fraction here or a fraction there can make all the difference. Positive margins affects 20-30% of women having breast conserving surgery in the UK. Patients with positive margins usually require another operation to shave away more breast tissue to be sure all the cancer is out. This leads to fears and stress about cancer being left behind, causes huge disruption for patients and their families as they have to arrange more time off work, and /or ensure they have arrangements in place to be looked after at home following surgery. The appearances of the breast are rarely as good after a second operation so this can lead to poor cosmetic results with impact of feelings of femininity and adversely impact on quality of life. The costs of the NHS should be considered. We estimate the direct costs of re-operation for positive margins being £22m. A potential solution is the intelligent knife or “iKnife”. 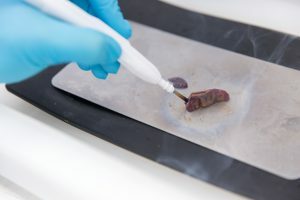 This tool invented by Professor Zoltan Takats from Imperial College London, uses Mass Spectrometry to analyse the smoke plume which comes off the tissues as a result of surgical electrocautery. The surgical diathermy blade causes tissues to heat leading to cellular explosion, the collective explosion of thousands of cells leads to a small amount of smoke which can be analysed using Mass Spectrometry which works as a sophisticated weighing scale, capable of delineating the spectral finger print of cancer and normal breast tissues. Put simply, our preliminary work suggests the device can accurately tell the difference between tissue types in an average of 1.8s. Myself and Professor Takats are leading a prospective multi-centre trial funded by Cancer Research UK, to determine if the iKnife can accurately detect a positive margin in-vivo during breast conserving cancer surgery. We will continue to recruit patients undergoing wide local excision surgery up until 2019 and the results are expected in 2020. If the trial is a success we plan to conduct a randomised controlled trial of iKnife guided versus conventional electrosurgery for breast cancer. Does access to electronic health records by patients improve quality and safety of care?